This is something that comes up a lot in education. How do we ensure all of our students are getting what they need to be successful and how do we ensure students feel that they are being treated fairly? This is a tough issue for me as an educator. How do I make sure that I satisfy the learning needs of all of my students (give them the equity they need) without it appear like I am favoring one student over another or being unfair? In order to achieve equity over equality, teachers must have a conversation with their students about what fair means (i.e. fair isn’t what you want ; it’s what you need). In addition, in order to achieve equity, a teacher need to be able to differentiate for each and every student. This requires differentiating every lesson plan, every strategy, and even the materials used throughout the day. Multiply this by 20-30 students with individualized learning needs, and you have to wonder, if it even possible? I understand the idea of this, but I feel that it is only truly possible in a classroom where students have already been sorted by abilities. The top 20% in one class, the next 20% in one class… and so on. Differentiation would be possible without any student feeling like the teacher doesn’t care about them. I agree with the other comments that this is truly difficult, one reason being what grades represent. If it is a “flying” grade and you swim rather than fly, I could give you an “A” in swimming, but it would be a misrepresentation to give an “A” in flying. I suppose the actual subject matter could be changed to “getting from point A to point B,” then everyone could do it the way they are able. 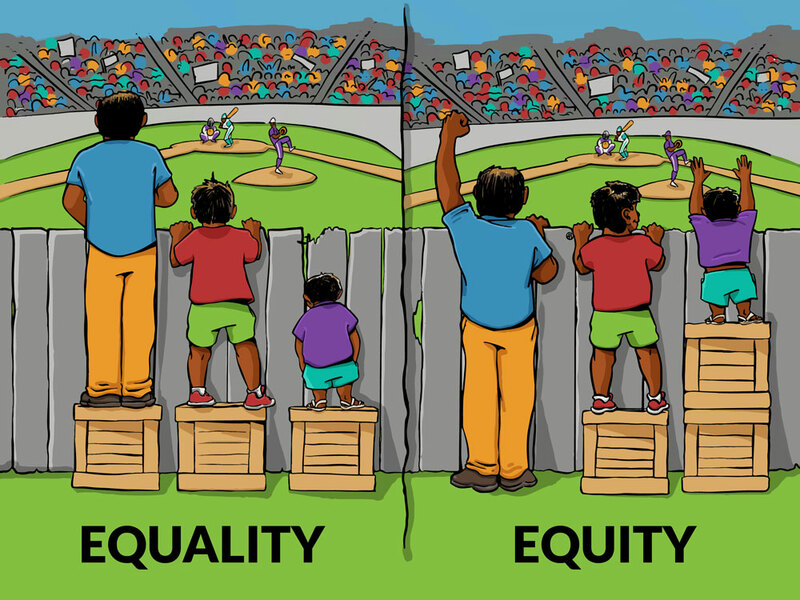 The picture shows what we as educators refer to as scaffolding, which is probably the best thing we can do to insure equity vs. equality. Anything you can conceive, if you believe, you will achieve! My website is powered by renewable energy thanks to GreenGeeks hosting. Copyright © 2019 Mr. Wittman's World. Proudly powered by WordPress	& Personal Portfolio WordPress Theme by Dinozoom.com.